Does anyone know if Indigo is getting decent advance booking for their Istanbul flight? Is there a difference in mindset for Indians living on the (US) West Coast vs the East Coast? Perhaps the pattern of immigration could point to why AI's DEL-SFO flight is profitable enough for AI to fly more than daily frequencies while EWR remains a problem child, and IAD presumably has never been profitable enough for AI to consider increasing frequencies to daily. I'm assuming the ORD and JFK flights, while not being profitable are able to cover their costs due to some connecting traffic. It's a shame we'd never know what a UA-AI codeshare could have achieved. I think in 15-20 years, by the time the US-India travel market is as well developed as the US-China market is currently, either UA, or more likely AI is going to cease existence. East coast I think is more financial traffic so Indian tech companies have smaller (compared to Bay Area) presence as backend service industry rather than core tech. UA with EWR would likely have captured a lot of traffic in the financial district with the corporate contracts. Places like ORD / midwest are a mix of financial + manufacturing + medical accounts. So the manufacturing accounts are even smaller and employ a mix of IT non-IT tech crowds like Caterpillar or Cummins or United Technologies. IT typically is paid more on an average. Delta's IND-CDG flight for example has been very popular with the Cummins crowd (who also have a presence in PNQ) who other wise would have to go IND-ORD/IAD/EWR/ATL-Onwards. Edit: Agree on the UA-AI codeshare point. VT-ITW has been grounded again at Lucknow due to an engine fault. No, what I am trying to get to, is perhaps for traditional immigrant cities like New York and Chicago, a large part of the immigrants from India were perhaps economic refugees, arriving before the economic reforms of the 1990's could significantly alter quality of life. Consequently most of them may be generally predisposed to believe that nothing of Indian origin can ever be good enough or measure up to Western standards. People of Indian origin on the West Coast have generally have had better access to some of the opportunities that economic liberalization brought in, and having worked and built companies side-by-side with Americans and immigrants from all other countries, are less likely to view their place of origin as not up to scratch. Note: this is my conjecture, I do not have empirical evidence to base this on. Please take with appropriate grains of salt. Wow just wow. “Economic refugees” The vast majority of Indian immigrants in the US are professionals who immigrated as skilled labor. They don’t have the weird anti indian thing you see on Anet. The ones who came in the 60’s and 70’s were very westernized (many went to schools that stilled had foreign teachers) but yet were also very Indian. It is why the BJP sees such strong support in the US. Just look at Anet. The few of us that post on the indian forums who are of Indian decent but born in the US almost uniformly say that their parent would gladly fly AI business class for the right fare. It is usually those from India that can’t understand why people fly AI when the ME3 beckon. The US crowd is typically not the biggest fan of the ME because of our perception of the way they treat Indians (plus all Americans love their FF miles). Not saying one is right or wrong. But your post misses the sentiment of those who have been here for 20 plus years. Be assured that those born abroad hold India to a high standard. We grew up in a time when there were very few indians abroad, and drawing disstictions on religion or where in India our parents came from just doesn’t resonate. Also our parents tended to be very successful so looking down on India goes against our own family story. My apologies if I have inadvertently implied that second generation Americans of Indian origin feel ashamed of their origins, that was not my intention. For every Bobby Jindal there is a Nikki Haley. Having said that, there is a significant difference in attitudes of people born here, and people who immigrated from India 30-40 years ago, and you cannot use the virtues of one to defend the shortcomings of the other. Again, restating the caveat that I do not have empirical evidence, I honestly don't have an explanation for a generation of Indian-origin Americans, perhaps best exemplified by Dinesh D'Souza, who seem to be ashamed of their roots. I'd rather not go into the politics of the Indian diaspora, as in my personal opinion, there is a significant portion of the diaspora that is animated by a strong dislike of a particular religion. I will read any comments in response to this, but I will not be responding on this forum, since this discussion is going off-topic. EWR India for UA has been doing quite well and I'm sure the 77W has been put because of good connections at BOM end. My main motto is to prove that people actually "like " to connect through DEL /BOM as much as they like to do via Middle East. Yes, and that feeds into my other point, EWR-India has been good to UA, but not to AI. Why is it that AI DEL-SFO commands prices premium to the ME3, but EWR-BOM/DEL has been chopped and changed around multiple times in the last 5 years? I think UA's EWR-India flights have have been largely O&D driven, since the flights land pretty late at night and connecting flights to other major cities via 9W are only available early morning. I've personally connected through DEL on AI a number of times, and I did not dislike it. I've seen some people of Indian origin react to the concept of connecting via any airport in India as if they were being asked to connect via LGA. This is absolutely correct. Tell my family that goes to BLR, COK or MAA to connect through DEL or BOM it's like asking them to commit a crime or something. They just won't do it. BUT they seem to have no issue going through LHR, DXB, DOH, FRA, etc. Though I will concede for many, myself included, we don't want a double-connection and getting to DEL or BOM might require an extra flight. But when it doesn't, at least judging by my family, it will never be considered. Perceptions of Indian airports and the experiences of the 1980's and 1990's die hard still for many. Though in those days LHR and FRA weren't much fun either. COK or MAA to connect through DEL or BOM it's like asking them to commit a crime or something. They just won't do it. BUT they seem to have no issue going through LHR, DXB, DOH, FRA, etc. Though I will concede for many, myself included, we don't want a double-connection and getting to DEL or BOM might require an extra flight. But when it doesn't, at least judging by my family, it will never be considered. Perceptions of Indian airports and the experiences of the 1980's and 1990's die hard still for many. Though in those days LHR and FRA weren't much fun either. It is not without reason though. On a good day it takes 1 hour to clear immigration and security at BOM. Its the luggage re-check thats more of a problem. Flying internationally into your destination airport means that you do not have to handle checked luggage at transit. Yup agreed. That said, look at the US that also forces pax to go through customs at their first point of entry. Many many people still connect when they could have taken an international flight to their destination. The point I am trying to make is that there is no one size fits all for every pax. Some pax might very well refuse (for what ever reason) to connect in India. But I hope people can concede that there is also a group that might prefer connecting in India because they feel more comfortable. That group is AI's bread and butter. Aside from AI at DEL, I think 9W has also proved it can handle Intl to DOM pax connections at BOM. The DL/AF/KL/VS partnership has been active now for some years. Have people posted things that 9W could do better, sure. But all in all, I am really surprised at the lack of negative reviews regarding connection issues / service let downs given the volume of pax DL etc have been funneling to 9W. Most people are actually quiet surprised at how pleasant BOM is. These pax include top tier Skyteam FF who expect seamless connections. 9W seems to have not disappointed this group. Hence why I have hope that 9W can pull it off. A final example. Let's say DL starts JFK-BOM. Which is a better routing: JFK-BOM-MAA or JFK-CDG-MAA? While I hear you on luggage recheck at BOM, I think not having to deal with the mess that is CDG might push JFK/MAA pax to the BOM connection (all other things being equal). I have transited through both and I would pick CDG anyday over BOM. You land at BOM anytime after 8 and you're screwed. I think people here are forgetting that there's a difference between connection at DEL and BOM. At BOM, the airport operator never utilizes the complete potential of T2 . It has the highest number of immigration counters in the country. However you'll never see all being utilized even during peak hours. However I think once there are significant hub ops at BOM, MIAL will utilize the complete potential and then connecting at BOM will be better than any EU airport. Well, present day T2 transfers are far superior to old Mumbai terminal transfers where you put your life in the middle of the night in the hands of an unknown taxi driver and his friends who always decide to hitch a ride at the last second. Lots of nail-biting moments for families waiting for their call. If they are able to kick out the LCC's when the new airport opens, 9W can make amazing use of BOM, with a true Hub. Unrave - I don't doubt you have had long waits at BOM. Fortunately your experience and my experience have been different. While my family usually arrives in Business class (so we use the J immigration lanes), the wait at BOM for immigration for us is never more that 15 min (many times 5 min). And we only arrive at the main EU arrival bank. There are those who actually prefer going through immigration/customs during their transit. You basically make good use of the transit time. In the end you have to clear Indian immigration somewhere. For some doing those formalities is better than shopping or sitting at the gate. But to each their own. Respect either way. There is no way any airline will give up a BOM slot. Also, it would be totally unfair for the government to make an airline give up a slot in BOM (kick out the LCCs in your terms). BOM just can't compete with NMIA in terms of convenience and demand. And which law would they invoke to do that? BOM is in India, not China. Same, will never fly intl via BOM unless there's an absolute requirement. DEL preferred though, not had too many bad flights via DEL (Dom to int'l connections). ha...! Never going to happen....! "ED special prosecutor Davinder Pal Singh said Talwar’s custody is needed to ascertain his role in “association with the bilateral air service talks and the inroads made by him to influence the decisions”. He added “role of key persons and their modus operandi” needs to be extracted from Talwar. He claimed that the agency has received “voluminous incriminating material” against Talwar." GUESS WHO IS THE BIGGEST BENEFICIARY OF THIS? Existing Indian carriers currently operating on the India- UAE route, because the government, pending the completion of the investigation, which could take a few years, will be too afraid to increase the bilaterals to UAE and Qatar. Yes, the likely fallout is that the bilaterals will be frozen for some time. Ironically, the biggest beneficiary will be Jet Airways which started numerous frequencies into AUH. 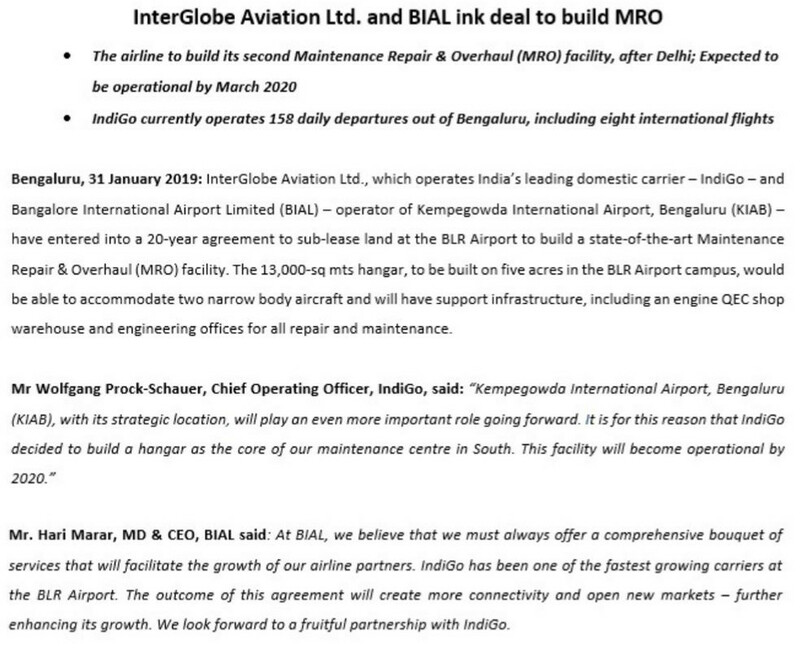 Just like they have the "advantage" of having numerous slots at BOM, they also have significant India - UAE operations for which additional capacity will continue to be restricted for both Indian and UAE carriers --- allowing them to raise fares on this route. Etihad may actually have had good foresight in aiming to have a higher stake in Jet Airways. This would be true if India - AUH bilateral was anywhere near to be exhausted, which it is not. It is not valuable to other airlines that cannot use AUH as a transit point either, since O&D is limited. BTW, elections are around the corner. Thats when bilaterals are expanded, not when they are nearing exhaustion. CNN being a brand new airport is going to have all such new city pairs as "firsts", so still not worth mentioning that in regards to the states. No one mentioned their previous first flights as to Telangana, Tamil Nadu, Karnataka, Maharashtra. That's true for the northern part of the country, but Southern states like Tamil Nadu and Kerala have always had decent intrastate flights, even in good old days of IC , so it's not really worth mentioning. It does sound lame (no offense). It would exciting to hear that in say Gujarat or Assam. Interstate flights have operated in many states in India even in the past when we only had IC and 9W doing domestic services. The Cabinet on Tuesday approved the India-Abu Dhabi bilateral air services agreement enabling their airlines to fly 50,000 seats each week, up from the current level of 13,700.
which is around 27,000 seats per week. The AUH and DXB entitlements are "close" at 50,000 and 62,500(?). Think of how many more flights are available to DXB when compared to AUH. Etihad is close to 50% on its side of 50K, obviously it also has access to Indian side quota thru 9W, say 40K (10K to others). So Abu Dhabi has plenty to grow. Emirates annual average was 49K/week during 2017-18, but on some weeks it probably crossed 68K/week (110% of 62K BASA). The Indian side also north of 90%. Air Arabia annual average 17K/week of 20K/week max. RAK 20K is an issue, Air Arabia wants to use that 20K. These are ballpark numbers based on crude math, a.net auditors need not ask for a forensic audit. Qatar actually tried a $10B quid-pro-quo investment deal with the State of Andhra Pradesh, but neither AP nor Raju entertained such offer. Complaints about BOM international to domestic transfers are perhaps valid, I have never transferred via BOM to know any better. I have however transferred via DEL from AI's JFK and ORD flights to connectors flying to domestic airports (in my case AI 22 to CCU) and vice-versa (AI 23). Since these flights were international connectors, AI handled luggage transfers both ways. Similarly, I completed immigration/emigration formalities at CCU rather than DEL. Apart from the somewhat long layovers, I didn't really have anything to complain about. AI has plenty of ground staff at DEL to help passengers through the security recheck, so I think even first-time flyers wouldn't have any problems. Doesn't matter because IndiGo has stated they'll code share for 20 destinations from IST. Well about jet, their code share partners AF and KL fly to many cities in EU from their hubs and 9W code is placed on each of them! But yes, this is excellent for Indian cities getting QR service as they'll have one stops to so many destinations now. As stated above by another user, 9W's codeshare partners AF/KL/DL/VS have openskies within EU and between EU and US. And not to forget EY's big network. That's obviously much larger than 6E's codeshare partners, if incase you have nicely decided to ignore 9W's partners. 9W flies to CDG/AMS only from a handful cities. A flier from a tier 2 city has to connect twice - once at BOM and once in Europe. That's there, but it all comes down to total time too. Number of stops doesn't determine everything. If 6E schedules flights to feed QR's EU wave both ways it helps, but if they randomly operate a flight to DOH based on how they want to utilise their aircrafts resulting in long transit times at DOH , then that would be more awful than a faster two stop flight. Also to ask, apart from Kerala, how many tier 2 cities from India does 6E connect to DOH ? Or how many can they add in future based on the quota of seats left as per BASA? Also to mention, 9W has multiple connectors to tier 2 cities from BOM and at the other end at their EU partner airlines hubs at CDG/AMS , they have multiple connectors to cities/day within EU. So who will be able to provide a more smooth and quick transfer (even if its two stops), 9W w. partners or 6E w. partners ? I just want to state an eg. of my travels between India- NZ. I mostly happen to find 9W+QF the fastest and cheapest ( and I get their whooping 45kgs baggage allowance on one-way tickets from India) ex-BOM even if it's two stops but with very short layovers at both SIN & SYD or BKK & MEL or any such combinations, because of good frequency of both 9W and QF to those places. Unlike the one stop options that "seem" convenient but have ridiculously long wait times at BKK (Thai Airways) or KUL(MH) or HKG (CX) or SIN (SQ). SQ's quick one stop flights are always priced premium unless if lucky on sale or booked very early. Funnily, sometimes even ME3 with the backtracking and two stops at their hubs & Aus have an overall shorter time to get to NZ with decent fares than many one stop options with long wait times. When did BOM become a tier 2 city? The BOM-NZ was a point I was trying make in relation to the number of stops as an example , if you did not catch that. Not that BOM is a tier 2 city. I should have posted that eg. at the end of 3rd** paragraph. And that was still not my point if you didn't catch it yet. Say someone wants to fly Indore to Nice (France). 9W has multiple flights IDR-BOM and AF has multiple flights CDG-NCE. So that'd be IDR-BOM-CDG-NCE. The return could also accordingly be through say AMS instead of CDG. Or even throw in EY+9W's mutiple feed from AUH to BOM. Who has a better chance to provide a more faster and seamless connection between the two routings bothways? I think that's obvious. The one stop will most likely have much longer waiting and the two stops will most likely have shorter layovers (because of probability of higher frequency at two hubs) and will be faster still overall. This was again addressing why two stop flights from tier 2 cities to EU ( through 9W & it's BOM hub) doesn't necessarily have to be worse than a one-stop to EU through DOH. The bolded part is not borne out of facts and is without basis. Airlines have interline agreement all the time and its just as painless as alliance partner airlines for the passengers. It depends on the timing of the flights, the terminals the connecting flights are in, the airport etc. I have flown BOM-FRA-JFK-SEA and back with AI/AA where AI and AA had just interlining agreements. I checked in my bags at SEA and collected it in BOM. The layover in JFK was just 2.5 hours. I have also flown SFO-HKG-SIN-BLR on SQ, where there was a layover of 7 hours in SIN even though I was flying SQ throughout. AF and KL flights from their hubs to EU cities are code shared by 9W not interline. And hence I had stated that as "most likely" on basis of probability. And that probability greatly comes down with low frequencies between city pairs. Higher the frequencies between city pairs, higher probability of short layovers. Lower frequencies between city pairs, more probability of longer layovers in the routing. This is simple logic. I never said it had to be always that way as a fact. You have just plainly given an example of a random long haul two stop flight to US and it isn't directly addressing the partnerships of airlines being discussed here on topic, whose tie-ups are working towards making these connections more seamless and quick like that of 9W and their partner airlines. These partner airlines are obviously going to work towards timings, common terminals, etc to make things more smooth. And hence I had stated that as "most likely" on basis of probability. And that probability greatly comes down with low frequencies between city pairs. I never said it had to be always that way as a fact. I was pointing out that the probability itself is only 50/50. All airlines look to maximise profits, whether 6E or 9W or AI. I gave example of SQ to say that even the same airline can't guarantee short layovers. Whether same airline or partner airlines, you can't guarantee short layover for all possible connections. Some will suffer. Same will happen whether 9W goes with EY/DL/KL or 6E goes with QR/TK. I was pointing out that the probability itself is only 50/50. All airlines look to maximise profits, whether 6E or 9W or AI. I gave example of SQ to say that even the same airline can't guarantee short layovers. And by what logic can you apply a sure shot number to that probability as 50/50? That's your own self-made hypothesis? Whether same airline or partner airlines, you can't guarantee short layover for all possible connections. Some will suffer. Where did I state they will gurantee a short layover for all possible connections? All the examples we're stated generally to get a understanding of which airlines can provide a decent seamless connections in the larger picture. You have just started nitpicking on every little thing now using unrelatable examples , right from giving a random example of a low frequency long haul airline like SQ to random interlining airlines to speaking of every possible connection. That goes fully against the close knit, high frequency , codesharing airlines we are discussing here on topic. I laid out reasons on why we can't assume only 9W/DL/KL will have better connections/layover etc (which too was your own self-made hypothesis BTW), and hence there is a good chance that even 9W/EY or 6E/QR/TK alliance might offer similar convenience and there is nothing to suggest one will be better than other. Hence the 50/50. I was just challenging your assertion(without facts) that there is a higher probability of 2 stop connections being of shorter duration than 1-stop connection.